Coleman has decided not to run for governor. (CNN) - Former Minnesota Sen. 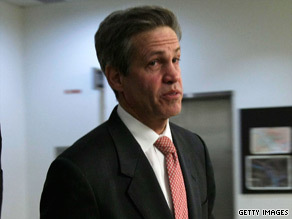 Norm Coleman will not run for governor in 2010, the Republican announced Sunday on his Facebook page. Coleman, who lost re-election to Democrat Al Franken in a close contest in 2008 that took six months to resolve, said it is the wrong time to launch a new campaign. "This is not the right time for me and my family to conduct a campaign for Governor,"
The Star Tribune of Minnesota reported Coleman's decision on its Web site. "It is too soon after my last race and too late to do a proper job of seeking the support of delegates who will decide in which direction our party should go," Coleman continued. "The commitments I have to my family and the work I am currently engaged in do not allow me to now go forward." Current Republican Gov. Tim Pawlenty announced last year he would not seek another term and several candidates from both parties have expressed interest in running for the state's top job. According to the Star Tribune, seven Republicans and 12 Democrats have filed to run for the seat. i admit, i would not vote for coleman. Can't blame him. I am sure the forces of the National Socialist Democrtic Pary (Nutzis) would find more votes in any county against him than there are registered voters, like they did with his race against that nasty, hateful geek Franken. It's not like he will win if he decided to run. I'm so glad Sen. Franken replaced this bum. Well, if he had stepped down back when they did the recount, he may have had credibility....He just looks pathetics now..
After losing to Jesse Ventura and Al Franken, Coleman worries Daffy Duck's name recognition would prove impossible to overcome. What do you expect after Tim Pawlenty has screwed up the State of Minnesota . This is very typical of other RED STATES which Republican Governors and Senators have run into pure disaster. How dare Coleman takes away the opportunity for my fellow Minnesotans and I to vote him out of office in a landslide. Boooo! For the reference of the conservatives that are going to call me a hating Democrat. I'm an Independent. So at least call me a hating Independent. I guess even he's smart enough to know he doesn't smell a chance after the stunt he pulled in the last election he participated in. Something fishy went on up there in MN. Coleman has the lead over Franken, but then suddenly a bunch of vote don't count and more Franken votes are found. Well, MN is the same state that voted a wrestler in as governor, so what can I say. Coleman even looks as greasy as a used card salesman. Does Minnesota really want to go through a whinny recount again? Does Coleman really have the stumach for another round of fund raising and kissing up to people (campaigning)? Does he really want the job is a better question. Poor Norm,another sad little man with a bag full of money but no soul to go with it.Were sure his lobbying money from big pharma and death assurance companies will keep him busy for a while. Good decision. If you can't be Al Franken, you will never beat anybody ever again. Coleman should never run for public office again after making a fool ofhimself duing the senate race. This is something you don't hear much about on CNN. There are now 15 republican congressmen scheduled to retire in 2010. All you keep hearing is about the 5 dems.